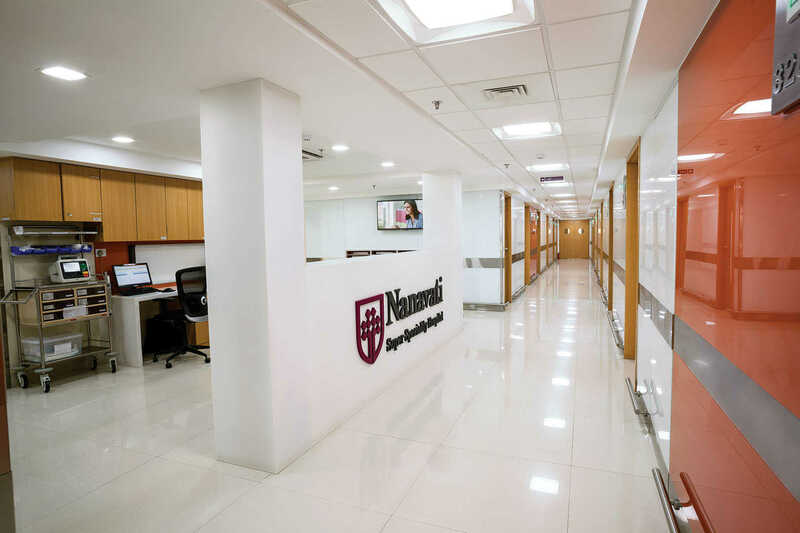 Nanavati Hospital, Mumbai - Mumbai, India | Costs, Consultation, Treatments, Doctors. Nanavati Super Speciality Hospital has been at the forefront of healthcare for 65 years. Various speciality departments offers a plethora of services in practically every field of modern medicine and health care. Our well-equipped hospital rooms, state-of-the-art departments and technologically advanced systems are all backed by the experts. It provides comprehensive cancer care with organ specific specialist teams in a holistic manner. The hospital offers advanced services for the treatment of heart conditions including minimal access cardiac bypass surgery. The bariatric surgery (Weight Loss Surgery) program at Nanavati is one of the largest in the region. The hospital provides a wide spectrum of super speciality services in the field of neurology, neurosurgery, urology, kidney transplant, nephrology, gastroenterology and surgical gastroenterology, liver transplant, orthopaedics including spine surgery, joint replacement & sports medicine, cosmetic & reconstructive surgery and comprehensive mother & child care. In addition, process driven critical care services, along with the most advanced diagnostic and imaging facilities, provide the necessary backbone for holistic, comprehensive and contemporary patient care. This is a surgical procedure which involves a process where unhealthy bone marrow tissue is replaced with a healthy one. An allogeneic transplant uses stem cells from a donor whose human leukocyte antigens (HLA) are acceptable matches to the patient's. A laparoscopic cholecystectomy is a surgery during which the doctor removes your gallbladder. This procedure uses several small cuts instead of one large one. A laparoscope, a narrow tube with a camera, is inserted through one incision. This allows your doctor to see your gallbladder on a screen. Inguinal hernia surgery is an operation to repair a weakness in the abdominal wall that abnormally allows abdominal contents to slip into a narrow tube called the inguinal canal in the groin region. An enlargement of the aorta, the main blood vessel that delivers blood to the body, at the level of the abdomen. An abdominal aortic aneurysm (AAA) can be life-threatening if it bursts. Abdominal aortic aneurysms are most common in older men and smokers. Catheter ablation is a procedure that uses radiofrequency energy (similar to microwave heat) to destroy a small area of heart tissue that is causing rapid and irregular heartbeats. Destroying this tissue helps restore your heart's regular rhythm. A pacemaker is a medical device that generates electrical impulses delivered by electrodes to contract the heart muscles and regulate the electrical conduction system of the heart. A pacemaker consists of a small, battery-powered generator and one or more leads. In a single-chamber system, one lead is used, most commonly pacing the right ventricle. Dual-chamber pacemakers have two leads, placed in the right atrium and right ventricle. A pacemaker is a medical device that generates electrical impulses delivered by electrodes to contract the heart muscles and regulate the electrical conduction system of the heart. Single-chamber pacemaker - With this device, 1 pacing lead is implanted in the right atrium or ventricle. Valve replacement surgery is the replacement of one or more of the heart valves with either an artificial heart valve or a bioprosthesis. It is an alternative to valve repair. Valve replacement surgery is the replacement of one or more of the heart valves with either an artificial heart valve or a bioprosthesis. It is an alternative to valve repair. Benefits of minimally invasive cardiac surgery (MICS) have been well recognized when compared with a standard median sternotomy, in terms of blood loss reduction, lower morbidity, shorter intensive care unit and in-hospital stay. Functional endoscopic sinus surgery is a minimally invasive surgical treatment which uses nasal endoscopes to enlarge the nasal drainage pathways of the paranasal sinuses to improve sinus ventilation. A laparoscopic hysterectomy is a minimally invasive surgical procedure to remove the uterus. A small incision is made in the navel through which a tiny camera is inserted. The surgeon watches the image from this camera on a TV monitor while performing the procedure. VP shunting is a surgical procedure that primarily treats a condition called hydrocephalus. This condition occurs when excess cerebrospinal fluid (CSF) collects in the brain's ventricles. CSF cushions your brain and protects it from injury inside your skull. Image-guided radiation therapy is the process of frequent two and three-dimensional imaging, during a course of radiation treatment, used to direct radiation therapy utilizing the imaging coordinates of the actual radiation treatment plan. Intensity-modulated radiotherapy (IMRT) uses linear accelerators to safely and painlessly deliver precise radiation doses to a tumor while minimizing the dose to surrounding normal tissue. Your radiation oncologist will speak with you to determine whether IMRT is the most appropriate treatment for you. The pancreas secretes enzymes that aid digestion and hormones that help regulate the metabolism of sugars. This type of cancer is often detected late, spreads rapidly and has a poor prognosis. There are no symptoms in the early stages. Later stages are associated with symptoms, but these can be non-specific, such as lack of appetite and weight loss. Treatment may include surgically removing the pancreas, radiation and chemotherapy. A cancer of plasma cells. The plasma cells are a type of white blood cell in the bone marrow. With this condition, a group of plasma cells becomes cancerous and multiplies. The disease can damage the bones, immune system, kidneys and red blood cell count. Symptoms may not be present or may be non-specific, such as loss of appetite, bone pain and fever. Treatments include medication, chemotherapy, corticosteroids, radiation or a stem-cell transplant. A face-lift (rhytidectomy) is a cosmetic surgical procedure to improve the look of your face and neck. A neck lift (platysmaplasty) is often done as part of a face-lift. You might choose to have a face-lift if your facial skin is beginning to droop, a common occurrence with aging. A face-lift (rhytidectomy) is a cosmetic surgical procedure to improve the look of your face and neck. A neck lift (platysmaplasty) is often done as part of a face-lift. You might choose to have a face-lift if your facial skin is beginning to droop, a common occurrence with aging. Upper lid blepharoplasty removal of excess skin, and occasionally fat from the upper eyelids in order to refresh the appearance of the eyes. It can be combined with a lower lid blepharoplasty or brow lift to give a more complete rejuvenation to the eyes and upper third of the face. Cheiloplasty or lip reduction surgery is a cosmetic surgical procedure that helps to treat unusually big, fat or protruding lips. A spinal tumor is a growth that develops in or near the spinal cord or within the bones and discs of the spine. Spinal tumors may be cancerous (malignant) or noncancerous (benign). Spine tumors, both benign and malignant can cause significant disability when they occur in the spine. Hyperbaric oxygen therapy (HBOT) is a medical treatment which enhances the body's natural healing process by inhalation of 100% oxygen in a total body chamber, where atmospheric pressure is increased and controlled. It is used for a wide variety of treatments usually as a part of an overall medical care plan. STI treatment require that a proper history of signs and symptoms taken, physical examination done and relevant investigations ordered. A proper treatment plan is then prepared depending on the findings. It is also known as a spinal adjustment. It is a term used by chiropractors to delineate the approaches to manipulating the spine. The chiropractor applies manipulation to the vertebrae, to reduce that subluxation and provided an effective lower back pain relief. All these manipulations should be done by a trained health professional in a hospital. Chiropractic is a medical profession that is committed to the management of musculoskeletal and nervous system disorders via non-surgical methods. Chiropractors have a special focus on spinal manipulation a treatment of surrounding structures. It is commonly used in the management of lower back pains (acute and chronic). Chiropractic techniques included Garston, Activator, Extremity manipulation, Trigenics, Gonstead, Thompson, Distraction, Korn specifoica, Atlas orthogonal, and diversified techniques. These are tests done to detect bone and joint diseases like cancers earlier. The test is commonly done when a patient present with bone and joint complains like pain. A bone screening test is widely used to diagnose osteoporosis. This is done by carrion out a bone mineral test. This is a technique used to help increase the flow of lymph. The increased flow helps improve the immune function and remove harmful substances from tissues which are then neutralized in the lymph nodes. Apart from this, the procedure helps improve healing after surgery, improves breastfeeding, and relax a patient. Manual lymph drainage is the commonly used technique. This is a medical devices that is fitted into the knee joint to give it support, especially when the person has pain that is emanating from the knee. They are used to provide support to the knee ligaments and the patella while one recovers from injury, to prevent injury, play sports, or to relieve pain in the knee. There are four categories of knee braces available i.e. functional, unloader, prophylactic and rehabilitative braces. Bioptron lamb is an optical device that emits light with wavelengths similar to the section of the electromagnetic spectrum that is naturally emitted by the sun, but it lacks UV light. The therapy acts naturally to support the body’s balancing and regenerative properties thereby helping the body to bring out its innate healing potential. The light produces bio-stimulation, i.e., stimulate the body’s biological processes positively hence strengthening the body’s functionality. It has no side effects and works naturally. Treatment is individualized and depends on one’s problem and the state of the area under treatment. It is used in dermatology, rheumatology, stomatology, cosmetology, cardiology, sports medicine, etc. It is used by physiotherapists in the rehabilitation of patients with neurological disorders to promote the motor and sensory pathways and facilitate motor control and normal movement. It aims to improve mobility and movement in patients with damage to the CNS. The concept is based on the brain's ability to reorganize, recover and adapt to changes after neurological damage. Paraplegia is an impairment in motor or sensory function of the lower extremities. It is usually caused by spinal cord injury or a congenital condition that affects the neural (brain) elements of the spinal canal. The area of the spinal canal that is affected in paraplegia is either the thoracic, lumbar, or sacral regions. Common victims of this impairment are veterans or members of the armed forces. If four limbs are affected by paralysis, tetraplegia or quadriplegia is the correct term. If only one limb is affected, the correct term is monoplegia. This is a hospital visit by a suspected allergy patient like asthmatics or request for review by allergy specialists. It is important for continuous monitoring of an allergic patient. It involves the evaluation and treatment of immune and allergy diseases. Allergy tests like skin prick testing will be done to identify the causes of allergic reactions in a patient and proper medications administered to the patient. The patient will be counseled on how to avoid potential allergens. This is an all-inclusive offer for accommodation and other hotel services at Crown Melbourne hotel available to patients during their entire treatment period in India. The clients will be offered great deals in good hotels to be able to have a conducive environment during their entire stay in India. Special discounts and offers like spas will be available. Crown Melbourne is a contemporary and stylish hotel. This is an all-inclusive offer for accommodation and other services available to patients during their entire treatment period in India. The package included consultation charges, a comprehensive oral exam, Bite-Wing and panoramic X-rays, 3D smile design, full mouth polishing and scaling, teeth whitening, customized porcelain veneers, and smile stimulation. Hotel stay and accommodation are included. This is a surgical procedure that is used to reduce one's risk of developing stroke by correcting present in the internal carotid artery or the common carotid artery. The procedure helps get rid of an atherosclerotic plug that usually develops in some patients arteries. It a complex cardiothoracic operation done to manage aortic arch aneurysms. The procedure is often needed once the aneurism enlarges to a certain size, or when there is aortic dissection or when it ruptures. During the surgery, concomitant repair of other defects in the heart can be performed e.g. coronary artery blockage. This is a technique that is used to smoothen and improve one’s skin texture. The most commonly treated skin is the facial skin. The skin can be improved and all scars removed. The technique works by removing the outer most layer of one’s skin. This is accomplished using agents that will injure a controlled injury to the skin which is the given time to heal naturally. The most common chemical agents used include beta hydroxyl acid peels, retinoic acid peels, jessers peel and phenol cotton oil peel. Tattoos are usually permanent once done. This new technology allows one to get rid of tattoo pigment particles. It does this by heating up this particle and fragmenting them into small pieces. These small particles will them be cleared by the body’s immune system. Tattoo removal by the laser may require several visits to the doctor typically at least seven weeks apart. These is a minimally invasive cosmetic procedure that is done to tighten sagging or loose skin and reduce appearance of wrinkles in one’s neck, face and body. Laser skin tightening uses heat energy to stimulate elastin and collagen reduction in deeper layers of the skin thereby gradually improving the skin texture and tone. It is a traditional Chinese medical practice. In this technique, the practitioner will stimulate specific areas of the body usually by inserting a needle through the skin. It’s a safe procedure as the practitioners use sterile needles which are single-use needles. It is currently considered a form of alternative medicine. This is a procedure that involves taking samples of the soft tissue in a patient’s bone. Bone marrow is described as the tissue located in bones. It is spongy and contains hematopoietic stem cell that produces blood products like white bold cells, platelets, and red cells. The sampled bone will then undergo a pathological analysis (bone marrow examination). It a psychiatric mode of treatment in which seizure get electrically induced in a patient to help provide relief from a mental illness.it is a procedure carried out under general anesthesia. ECT causes some changes in a patient’s brain chemistry that help reverse the symptoms of certain mental disorders. It is also known as heliotherapy or phototherapy. It consist of exposure to specific wavelengths of light using light emitting diode, dichroic light, fluorescent light or daylight. Techniques include: light boxes, and photodynamic therapy. It is an effective method to treat SAD. This is a patient review by a qualified immunologist. It includes tests done to diagnose or rule out a suspected immunological diseases. If present, a proper treatment plan including follow-up will be discussed with the patient. This is a non-invasive medical test that is done overnight to allow physicians to monitor ones sleep so as to see what is taking place in the body and brain. For this test, the patient will be taken to a sleep laboratory in a sleep center or a hospital where he will spend overnight. The most common sleep studies include multiple sleep lacency test (MSLT), polysomnogram and maintenance of weakness test (MWT). This is an advanced form of physical therapy (flexibility training) that incorporates the contraction and stretching of target muscle groups. It improves the strength of muscles and increases flexibility. In vitro fertilisation is a process of fertilisation where an egg is combined with sperm outside the body, in vitro. "postgraduate merit scholarship" by the university of Bombay for a period of 6 yrs for excellence in MBBS& MD examination. Fellow Ship BMT - Leukemia/ BMT program of British Columbia, Vancouver General Hospital and BC Cancer Agency, Canada. Over 6 years experience as a Dental surgeon. 18 year experience in GI Surgeries. Best poster award on "Án Unusual Presentation Of Gouty Tophi In Knee"
16 years experience in endourology and laparoscopic urology and uro-oncology. Qualification: DM Clinical Hematology -All India Institute of Medical Sciences (AIIMS), MD Internal Medicine, MBBS, Fellow Ship BMT - Leukemia/ BMT program of British Columbia, Vancouver General Hospital and BC Cancer Agency, Canada. Large experience in the management of Obstructive jaundice, both benign & malignant over the last 22 years. Liver & Pancreatic surgery for both benign & malignant diseases. Areas of interest include Living Donor liver transplant, Liver resections and Hepato-Biliary Oncosurgery.